There is a school uniform which all children are expected to wear, and we very much value parents’ support in maintaining high standards of school dress. We believe that there is much to recommend the wearing of uniform. Uniform helps the children to feel a pride in their school and personal appearance, and when worn regularly, is more economical in the long run. 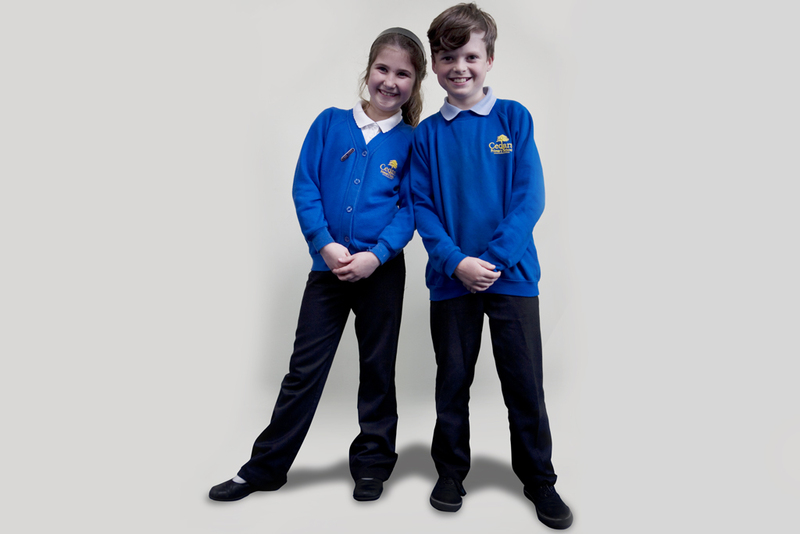 All items of standard school wear can be purchased from any shop of your own choice. Sweatshirts, cardigans, polo shirts and hoodies printed with the school name are available to order online from Tesco and Maisies – see ‘Purchasing Uniform’ below. We ask that parents do not send children to school wearing jeans or other play or sports wear, high-heeled shoes, clogs or other unsuitable types of footwear. We also ask for your support in not sending children to school wearing make-up, nail varnish or jewellery (the only exception being for children with pierced ears who may wear one sleeper or stud in the lobe of each ear but, for reasons of safety, these must be removed or covered with a plaster for PE and games lessons). Similarly, children should not come to school with an extreme or conspicuous hairstyle, eg no hair dye, shaved shapes or hair gel. A drawstring bag with a set of named, spare clothes including underwear, socks tights etc as appropriate. Please mark all items of uniform and clothing CLEARLY with the child’s name. Much unnecessary time is wasted trying to find owners of unmarked clothing. For colder weather a warm long sleeved top and jogging bottoms, or a track-suit will be needed, preferably plain black or royal blue. A recommended royal blue hoodie is available from our uniform stockists, Maisies or Tesco. PE bags and book bags can be purchased from the school office. During the year, six-week swimming sessions are arranged at Middleton Pool for children in certain Key Stage 2 classes. A one-piece swimming costume and towel will be needed. Please mark all items of uniform and PE clothing CLEARLY with the child’s name. Much unnecessary time is wasted trying to find owners of unmarked clothing. We ask that parents proviede an apron or shirt for the Art and Design technology activities. We also ask that all items are clearly named. or the Maisies website: www.maisies-superstore.co.uk or visit their store at: 60-64 Church Street, Wolverton, MK12 5JW.